The ultimate crossbody bag for fall! - Susan Said... WHAT?! As fall quickly approaches, I’ve begun culling my summer clothing, shoes, and handbags. It’s a process I dread, because I have so many pieces that I love. But, some are simply too summery looking as the leaves begin to turn red and the temperatures dip. The only thing that makes it easier is… something new. And this fall, I have the perfect antidote to my closet transition blues. 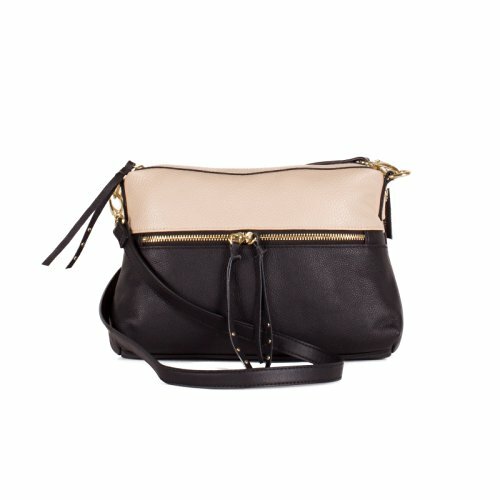 It’s a gorgeous Liv Bloc Party crossbody bag from Olivia + Joy. This two-tone, pebble grain, leather crossbody bag is sure to inspire some serious handbag lust. And, it is such a contemporary look for fall! Pairing dark blue and black is a great way to combine neutrals. In fact, this color combination ensures that the handbag will work with almost everything in my fall wardrobe. This classic crossbody style is not only beautiful, it’s also incredibly functional. A long, single strap is wide enough to be comfortable, but is thin enough to be chic. And although the bag measures a mere 10.25″ L x 4″ W x 7″ H, it is so well designed, the capacity is much more than you would imagine. The main compartment is roomy enough to fit a small wallet, a phone, and miscellaneous makeup, with space to spare. Plus, I’ll never again lose my keys, because inside there is a zippered pocket, plus a sewn wall pocket, and even a front zip pocket! And, it offers excellent construction from a name you can trust. The leather is soft and supple, the hardware is sturdy and durable, and the stitching and details are all top quality. Of course, I shouldn’t be surprised. Since 2011, Olivia +Joy has created on-trend handbags with painstakingly attention to detail. The line includes luxe bags that are meticulously executed and include high-end details like whipstitching, embroideries, signature hardware, and even painted edging. This crossbody bag retails for $98. on Amazon. And, it’s also available in a stunning black / bone combination (pictured above), as well as a useful black / black version. To see the entire line of clutches, totes, duffle bags, handbags, crossbody bags, and more, visit Olivia + Joy. PHOTO: Image used with permission by Olivia + Joy. DISCLAIMER: No financial compensation was received in exchange for this post. I did, however, receive a promotional sample of the Liv Block Party crossbody bag from Olivia + Joy in order to fully evaluate the product. Regardless, I only recommend products or services I believe will be good for my readers.